HUUB designed their neoprene swim socks or "booties" knowing how difficult it can be to adapt to the start of season open water swims. These socks are designed with 3mm neoprene that uses the body's natural heat to warm a thin layer of water between your feet and the neoprene. 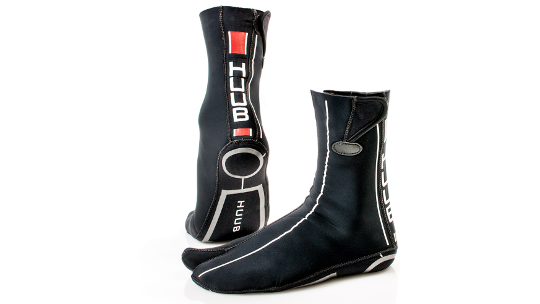 The boots are secured into place by a velcro strap which can be worn either under your wetsuit or over your wetsuit. Finally, a reinforced sole protects your feet from pebbled surfaces, providing non-slip protection and resistance against abrasion. Now all that's left for you to do is get out there and enjoy the fantastic experience that open water swimming offers. 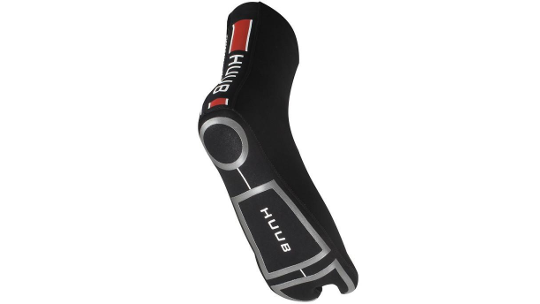 HUUB's Neoprene swim socks, are worn to protect the feet from the hard ground, stones and sharp objects through a protective reinforced sole which provides ‘non-slip’ protection and abrasion resistance. The 3mm neoprene helps to keep your feet much warmer for both training and when allowed in races (when conditions are very cold and if allowed by the race organiser). Adjustable velcro closures make this neoprene sock suitable to be worn either over or under your wetsuit and prevents against the reoccurrence of water entrance.